The characters Hiss, Squawk, Bellow, and Mutter in my new dialogue are business men, and they talk just like their names imply. It’s a part of the new dialogue collection I’m writing. Dialogues is a series of short fictional stories written entirely in conversational form. So far, there are 11 works written for the collection. A new dialogue arrives every week of 2018. Follow me on Medium or subscribe via email to keep notified there. In other news this week, I had two publications come out. One, about a lost little boy, was published in The Creative Cafe. 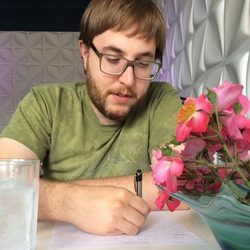 The other, about a kid with a body hair fetish, appeared in Literally Literary. Check them both out, please! Klavdiya: We should call the police. Galina: No. Think about how bad that will look. Klavdiya: But we need help looking. Galina: Our jobs are on the line, Klavdiya. I know that this isn’t where you want to be, but this is my career. And I’m not going to lose it because we lost our cool and called the police. Klavdiya: We should call the police because we lost a baby. The first story for my 2018 challenge has been listed. Expire explores the difficulty of conversation, conveying meaning, and comprehension. It’s a fitting first piece, as the general theme of Expire will be explored if not explicitly then implicitly through the very form of dialogues themselves. Thanks for following me on this journey as I write this dialogue series. Whether you follow the blog or follow on Medium*, I appreciate all the support, claps, and likes. *To navigate through the series, just click or swipe right to progress forward, left to progress backwards. If you have the app or you’re subscribed to the series, it saves your progress so you don’t have to read it all at once. Note: some web browsers will ask that you “read on a larger screen” when it comes to series. This is an EASY FIX. Simply zoom out a bit, or you can go full screen. Either option works. F11 on most PC keyboards is a great shortcut for going full screen and back. Hitting the control (Ctrl) key while using the scroll wheel on your mouse is the easiest method for zooming in and out (assuming you have a mouse and it has a scroll wheel).You can also read the series on your phone by using the Medium app. Expect a post about one new dialogue every week of 2018. 3:AM Magazine published my surreal short story, Irony. It’s about a boy, a girl, and some weird stuff. Digital manipulation of Théodule Ribot‘s Still Life with Pumpkin, Plums, Cherries, Figs and Jug, oil on canvas (circa 1860).